In a slideshow predicting the 2012 Stanley Cup playoffs written just 10 days ago, I had the Nashville Predators making it to the Finals after an epic Western Conference run involving three seven-game series. So much has changed in 10 days that I will be doing all new predictions by the end of the week. The Detroit Red Wings are spiraling out of control and have a better chance to finish fourth than first. The Dallas Stars have had their winning streak snapped and the San Jose Sharks may have turned a corner from their disastrous five weeks that began in early February. The Calgary Flames have cooled off and the Colorado Avalanche are red hot. 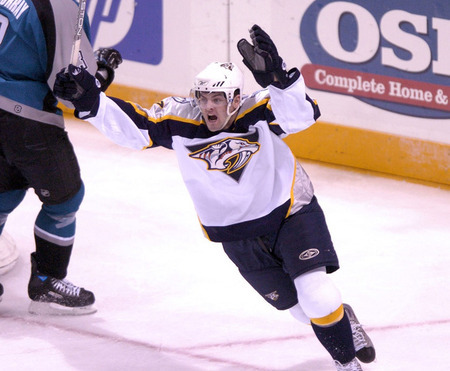 Then the Predators, who had already added Hal Gill, Andrei Kostytsin and Paul Gaustad at the trade deadline, received big news: Alexander Radulov, a 26-goal, 32-assist NHL forward in 2007-08 that they lost to Russia’s Kontinental Hockey League that summer, is on a team eliminated from his league’s playoffs. He wants to come back to the NHL to fulfill the last year of his entry-level contract. Radulov is in a unique situation: Because he is under contract and remained on the roster as a suspended player, he can be added to their active roster after the deadline without having to clear re-entry waivers and be eligible for the playoffs. He is expected to be active as soon as Thursday. In other words, the Predators get a top-six forward for the playoff run without having to give anything up and no one can stop them from adding him. While they will have to count nine games and the playoffs as a full year and allow Radulov to be eligible for free agency, it is well worth it. Shea Weber and Ryan Suter make up arguably the best defensive pair in the game and the Predators have enough serviceable players on the blue line behind them. They have one of the best goalies in the world. The one weakness they had was a lack of top-six forwards. They still do not have any truly elite forwards. But David Legwand, Martin Erat, Mike Fisher, Patric Hornqvist, the Kostytsin brothers and Gaustad already gave them enough skill to bleed to their third line. Adding Radulov gives them more forward depth than any other team in the league. They already have the best work ethic and receive the best coaching. They are hungry. They have learned to win playoff series. This team may not finish better than the fourth seed, but they no longer have to pull off the big upset to make it through the Western Conference. Thanks to their intangible advantage over the Canucks, they are now the team to beat out west. The trade-off for allowing Radulov to count two-plus months as a full season is it obviously improves their best chance ever to win a Stanley Cup. Yet this move could pay dividends down the road, too: A deep run and proximate payday makes him and both blue line studs more likely to stay this offseason. The extra revenue and excitement generated might even help them afford at least two of them next season. For a decade, this team could not get out of the first round and was on the verge of bankruptcy. Even for the first half of this season, they had the lowest payroll in the league (currently they are fifth-lowest). In a few months, they may have a set themselves up to be contenders for years to come. 2011-12 NHL Season Decided During This Week's Key Contests?